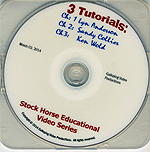 Home > Sandy Collier > 3 TUTORIALS - FROM THREE OF NRCHA'S BEST TEACHERS! 3 Tutorials - From Three of NRCHA's Best Teachers! This DVD features three separate tutorials: With Lyn Anderson, Sandy Collier, and Ken Wold Three of NRCHA's Best Teachers! Lyn Anderson, Sandy Collier, and Ken Wold are three of the most highly regarded horse trainers in the NRCHA with multiple World and National Championships in addition to very successful careers in coaching non-pros and teaching clinics all over the US and internationally.